develop, he confuses the answer to a second-order natural question (why do people build political institutions?) with the answer to a first-order normative question (what sort of institutions should people build?). One gets the sense that he is willing to enlist just about any explanation of human behavior to combat the economic-centric historical theories of Locke’s laissez-faire descendants such as Friedrich Hayek and Mancur Olson. Meaney is viewing Fukuyama’s thesis through the lens of a decades-long disagreement over basic philosophical questions, but I think this leads him astray. Fukuyama does indeed ask why people build political institutions and why different people build different ones, but the bulk of the book really isn’t especially concerned with the kind of institutions they should build, even if Fukuyama’s own preferences are plain. To a reader who comes in largely cold, as I did, the book is far more descriptive than it is prescriptive. In any case, Fukuyama’s basic thesis isn’t really all that novel. States, he says, basically exist on a continuum of central authority. If you have a strong central authority unchecked by other actors (local nobility, independent cities, religious leaders, etc.) you end up with despotism. If you have a weak central authority and lots of competing power centers, you end up with a state too feeble to get very much done. Western Europe, he says, largely via accidents of history, ended up somewhere in the middle and prospered. But how do strong central authorities evolve in the first place? Fukuyama spends a great deal of time talking about kinship structures and the way they interfere with state building (thus the brief foray into primate psychology at the beginning of the book). Loyalty to family and tribe is naturally strong, he argues, and tearing down that loyalty is crucial to building an effective state with adequately strong central authority. This, again, isn’t an especially novel observation, but his application of this observation to early Christian history was new to me. “The Catholic church,” he writes, “took a strong stand against four practices: marriages between close kin, marriages to the widows of dead relatives (the so-called levirate), the adoption of children, and divorce.” All of these are things that help kinship groups keep property within the group, and by systematically cutting them off, and then promoting the voluntary donation of land and property to the church itself, the Catholic church enhanced its own power. Later on, rules like priestly celibacy were designed to prevent kinship groups within the church from interfering with the central power in Rome. All of this strengthened the power of the church at the expense of kinship ties, and while undermining the family may or may not have been a deliberate strategy, that was the end result. Tribal and family connections in Western Europe became (and remain) much weaker than in much of the rest of the world. 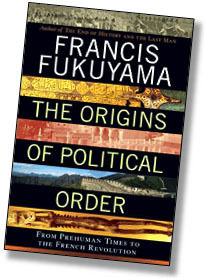 Despite Fukuyama’s assurances to the contrary, these sorts of forced comparisons create the impression that The Origins of Political Order is gamed from the beginning, with the book—and history—reaching its foregone climax in the Western European states that avoided Chinese and Indian excesses. Well, sure it’s gamed. But that’s not because Fukuyama isn’t playing fair, it’s because he knows how history turned out. Like it or not, Western Europe did develop a globe-spanning empire before anyone else, and Fukuyama is quite legitimately interested in trying to figure out why. Maybe his conclusions are right, maybe they’re wrong, but he doesn’t really have any choice other than to seek answers to the question of how things actually turned out rather than how they might have turned out. It’s like complaining that Einstein cheated when he developed General Relativity because he knew the real-world observations he had to explain before he started. Fukuyama curiously glides over the major historical problem in The Origins, which is, quite simply, that liberalism, capitalism and democracy have always been uneasy bedfellows. In its raw form, the principle of democracy—rule by and for the people—sits awkwardly with the defining principle of capitalist organization, which necessitates political arrangements that encourage unequal concentrations of wealth. Democracy has prospered in the West largely because its capitalist economies have redefined what democracy means. Fukuyama may well be too convinced of the historical superiority of market-based democracy — though this hardly tallies with his supposed allergy toward economic-centric historical theories — but Meaney may be making more of this than he should. That there are tensions inherent in late capitalism is hardly an esoteric observation, and it’s just not true that Origins “curiously glides over” the subject. It deliberately glides over it because it’s a book about pre-Malthusian state building and halts around 1800. Volume 2 will tackle the past 200 years, which is where you’d expect Fukuyama to take up the interplay of liberalism, capitalism, and democracy in the modern world. It’s inevitable, I think, that any account of something as complex and contingent as state building runs the risk of sounding like a just-so story. But if there’s a defect to Origins, it strikes me that it’s just the opposite: the book is full of fairly dense historical description and fairly light on overarching theory. And Fukuyama spends several chapters, totaling nearly a hundred pages, describing several European states in a deliberate attempt to illustrate just how fortuitous and chancy successful state building is. So, yes, one of his messages is that the subject is more complex than a simple economic-centric model can account for. But that’s a feature, not a bug. After all, if you want to understand why human beings do things, you need to understand human behavior, and in a lot of ways we’re all still just hairless apes. So bring it on: primate psychology, tribal loyalties, religion, kinship structures, economic and geographic factors, the interplay of interest groups, and ever so much more. Whether Fukuyama can eventually produce a coherent model of state building from all this remains to be seen. But Volume 1 isn’t a bad start.